This avant-garde nouveau beatnik look also has touches of subversive punk amongst the shaggy layers! 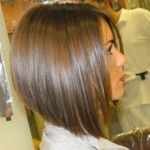 The basic cut is a long bob, with heavily textured ends for an edgy ragged outline. 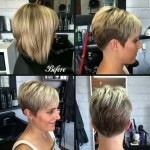 Within the shape, the hair has been razor-layered giving lots of texture and movement. The styling is asymmetric with a short side parting near the crown, which creates a straight sweep of the long fringe over one eye. On the other side of the blurred parting, the fringe is cut shorter to hover above the other eye. Copper balayage accents, highlighting the multi-layered, ragged finish, are blended in with blonde for a confident, arty finish!